Next Yoga on the list is called Gaj-Kesari Yoga. It is known to be a yoga which can bestow loads and tones of wealth, luxury, vehicles and what not? Again, every yoga gives 100% results only when the planets are at right degrees, right houses and right signs, moreover person should go through the Mahadasha/Antardasha of planets involved, then only results will come to fore. Now, lets see what is Gaj-Kesari Yoga? 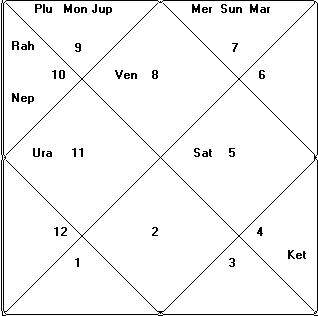 So, Gaj-Kesari Yoga when Moon and Jupiter are in conjunction in a house in any horoscope (please see picture) or they are at the difference of 4 houses, like if Moon is in 1st house then Jupiter should be in 4th house. If Moon is in 2nd house then Jupiter should be in 5th house. It can be in reverse order also, like Jupiter is in 1st house and Moon is in 4th house. Basically, the gap between Jupiter and Moon should be 4 houses only. Impact - This Yoga gives full results if Jupiter and Moon are in conjunction in Kendra Houses (House # 1, 4, 7 & 10) or Trikona Houses (House # 1, 5 and 9) or they are at 4 houses difference in Kendra Houses, like Moon in 1st house and Jupiter in 4th house or Jupiter in 4th house and Moon in 7th house. Its effect reduces when it involves other houses like Moon in 3rd house and Jupiter in 6th house, as Kendra and Trikona Houses are the most powerful houses of a horoscope. Another thing which reduces this yoga's effects is last post, i.e. Functional Benefic and Functional Malefic planets. So, if for an ascendant, Jupiter or Moon are functional malefic planets, then it will reduce the good effect of this yoga to a great deal. And of course, the results of this yoga will be seen in Jupiter and Moon's Mahadasha or Antardasha. @ vamsi - yup it does. Sir, Iam cancer asc i have moon in taurus 15°, jupiter in scorpio 18° mutually aspecting but jupiter is retrogade and aspected by saturn from 8th house with 27° is this combination forms yoga? @ AC - how jup-moon in cancer will create Neech Bhang? There is big question if gajkeshari yoga is created by jupiter and moon both in cancer (in kendra or kon) then jupiter makes nichbhang and gajkeshri yoga. In this case how much effetive will be this yoga?